➢ “The sequel, 16 years on from the original, now technology has made it possible to go down further, get closer, see clearer, see for the first time whole new worlds. And as the oceans are changing faster than ever before, never has it been more important to understand what’s going in them. It has been more than four years in the making, 125 expeditions, 39 countries, 6,000 hours diving underwater. So spit on your TV screen, rub with a squeaky finger to prevent fogging up, rinse and let’s go …” — The Guardian. ➢ “Following an introduction in which David Attenborough spoke of how revolutionary new filming technology had allowed the makers to ‘enter new worlds and shine a light on behaviours in ways that were impossible just a generation ago’, the glories just kept on coming … Some of the most eye-popping sequences didn’t involve wildlife at all, but revealed the power, majesty and beauty of breaking waves in high-definition slow-motion sequences.” — The Daily Telegraph. ➢ “The sheer hypnotic beauty of the deep is this show’s biggest draw. It is the kind of telly that makes you wish you had a bigger one, possibly even a cinema, to watch it on. It is also, in contrast to much natural history programming, full of hope. It is true the walruses were struggling to find ice sheets to rest on due to global warming but the other ocean stories … reminded us there [are] whole worlds as yet unspoiled.” — Daily Express. ➢ “Attenborough and the buccaneering team behind him were at pains to communicate that the submerged world they have revealed in jaw-slackening high-definition is itself in dreadful peril and its careless, gangly human custodians must ‘learn quickly’. Here was the Beeb at its most majestically Reithian. An enchanting magic lantern show of underwater moments – a front-row encounter with surfing dolphins and a ballet of plankton-slurping Mobula rays – knitted together with a narrative that offered a profound lesson in the threat posed by environmental degradation.” — The i. 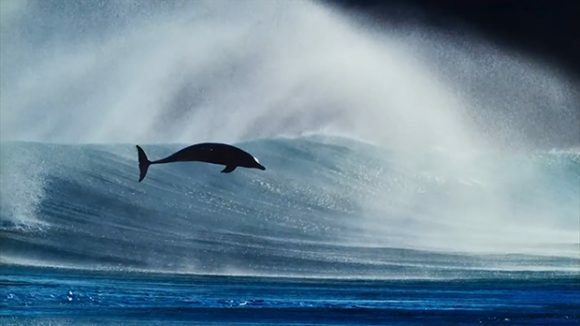 ➢ “To me, wrapped and rapt in the wrasses, or the orcas slapping herring, or the dancing surfing dolphins, or simply the tower-block waves crashing, slo-mo ethereal, off New Zealand, this, and (crucially) the story of its filming, was magnificent enough to defy all criticism other than the magnificently picky. Wasn’t that four-millionth Norway herring slightly out of focus?” — The Observer.